Regularly achieving more than $1 billion in daily trading volume, OKEx is a large and popular cryptocurrency exchange offering several coins, margin trading, fiat trading pairs, and even futures. 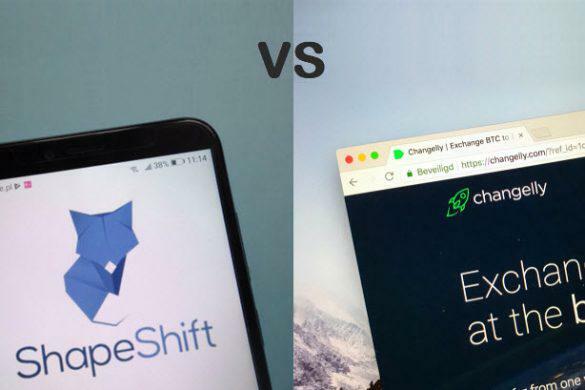 Just like how Coinbase Pro represents a buttoned-up, advanced version of Coinbase, OKEx is higher on the learning curve than its more basic sister exchange OKCoin—and is aimed at experienced traders. Both were founded in China by successful investor Star Xu though the platforms were moved to Malta given a more favorable regulatory environment. OKEx offers a wide array of assets to trade, derivatives, and leverage but suffers due to its restrictions on new users. Interested traders from the United States and other nations cannot be accepted as members due to grey-area of existing regulations in these countries. 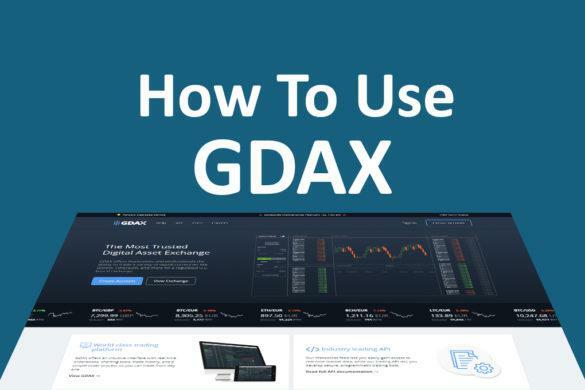 Additionally, the exchange’s interface will be familiar to veterans, but can be overwhelming for beginners and those who are accustomed to the simpler dashboards of Binance, Bittrex, and the like. 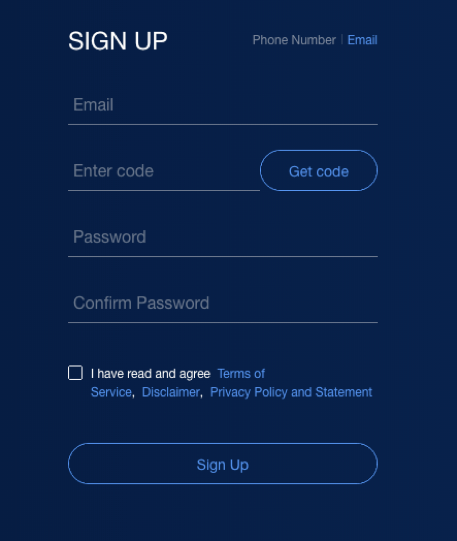 Creating an OKEx account is easy and straightforward. To sign up, simply enter your email and click ‘Get Code’. Your email address should receive the code within a few seconds. Afterwards, you’ll enter the code into the form, choose and confirm a password, and then click ‘Sign Up’. If you fail to enter all the information within 60 seconds, you’ll need to resend the code and try again. OKEx has four tiers of verification, with unverified members able to make single trades in amounts up to $2000 while tier 1 members able to initiate single trades of up to $10,000. 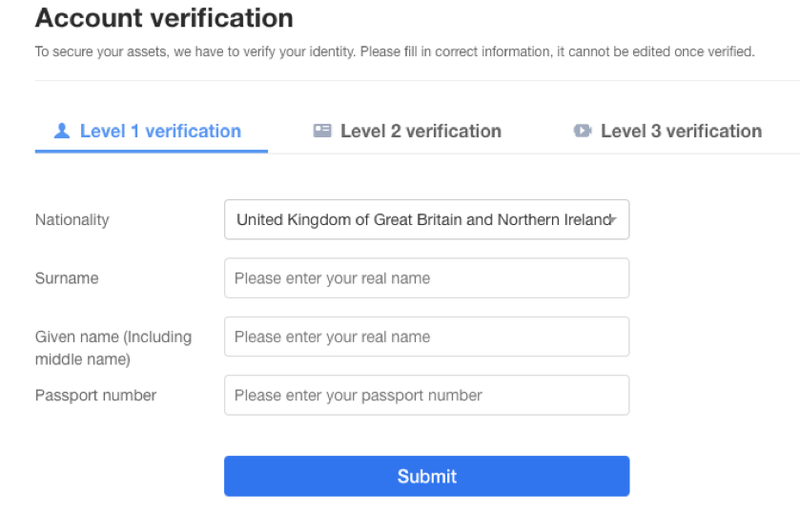 These users only need to choose a user name, submit their country of origin, and enter an ID number. Tier 2 traders enjoy a limit per trade of up to $200,000 but must upload a full set of identification documents. Tier 3 traders can trade up to $500,000 in a single position and need to verify their identities via video. Cryptocurrency and fiat funds can both be deposited to OKEx. 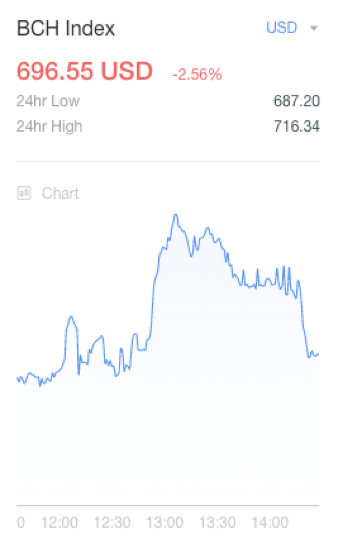 Click on the ‘Account’ link on the top right-hand corner of any OKEx page. 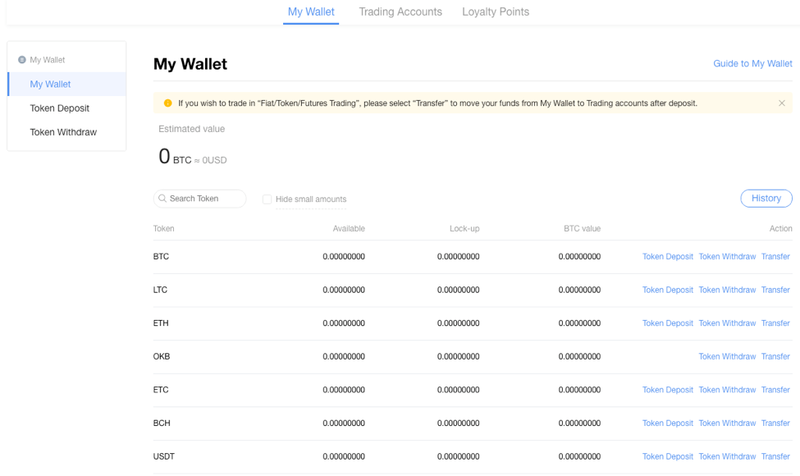 You’ll immediately be taken to the ‘My Wallet’ page, where your balances are listed by coin. From your wallet, you can click on the ‘Token Deposit’ link in blue text, which is located to the right of each coin on the balances list. Copy and paste the address generated by OKEx into the wallet you’re withdrawing from, and the coins will shortly appear in the relevant OKEx wallet. Depositing coins is also possible by clicking on ‘Token Deposit’ in the box on the top left side of the wallet page. Here, you can choose the token you wish to deposit from the drop-down menu. Regardless of whether you use this method or deposit directly from the wallet page, OKEx will generate the appropriate deposit address for you. Traders are also able to deposit fiat funds to their OKEx wallets. Click on the ‘Fiat to Token’ tab on the top of any OKEx page. Then, click ‘Payment Settings’. If you aren’t a Tier 1 member or haven’t linked your phone to your OKEx account, you’ll learn here that these are both prerequisites for making fiat deposits. 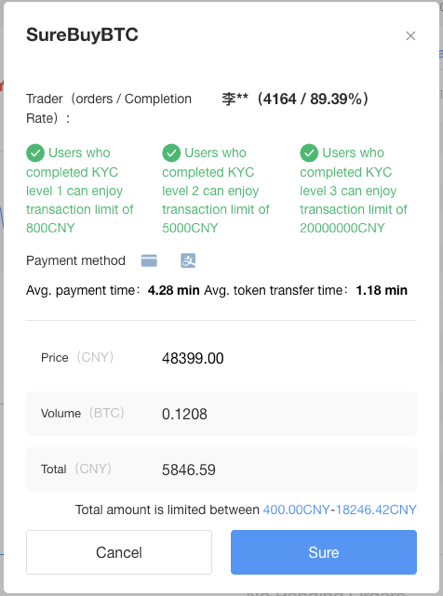 You can deposit fiat currency via a standard bank transfer, WeChat (the popular Chinese chat application), and AliPay. Given the presence of both fiat currency and cryptocurrency deposit capabilities on OKEx, users can buy coins and tokens with each type of currency. Buying coins and tokens with cryptocurrency is a streamlined and simple task. 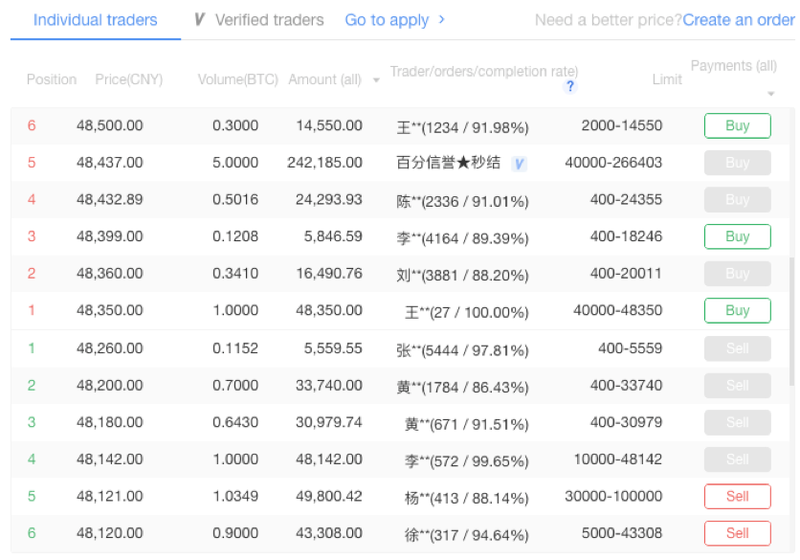 Navigate to any OKEx page and select ‘Token Trading’, then ‘Classic Trading’ or ‘Advanced Trading’ from the drop-down depending on how much information you prefer visible. 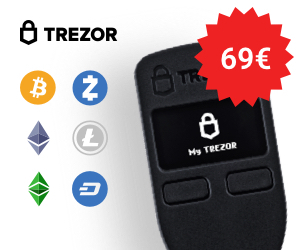 You can buy any of the listed cryptocurrencies with the USDT (Tether), ETH (Ethereum), Bitcoin (BTC), or OKB (OKEx coins) in your wallet. Click on your preferred payment method at the top of the page to see the relevant trading pairs reflected in the box at the top left portion of the page. Enter the type of order you’d like to make, the price you’d like to buy at (a Market Order is always at market price), and the total amount of cryptocurrency you’d like to use for the purchase. Click ‘Buy’ to finalize the purchase. The order will then show up in your “Open Orders” list at the bottom of the page. To buy coins and tokens with fiat current, you’ll first need to deposit funds into your OKEx fiat wallet. Navigate to the ‘Fiat to Token’ tab at the top of the OKEx page. You’ll immediately see a list of open contracts, some of which are created by individual traders on the platform, and also boilerplate contracts maintained by the exchange itself. Click on the coin or token you’d like to buy on the left side of the page. Make sure you’ve chosen the correct currency, though at present, the only option is CNY. Find a contract that suits your needs. Relevant criteria are Price, Amount, and Limit. You can also see the name of the trader offering the contract and their status. It’s always recommended to trade with Verified traders if possible, so click on this tab to filter by verification status. Click on ‘Buy’ or ‘Sell’ depending on the purpose of the contract offered. A pop-up will appear with the trade’s details and a request for confirmation. Click on ‘Sure’ to open your trade. To sell coins and tokens on OKEx, you’ll follow the same process as you would if you wanted to purchase them. Withdrawing coins and tokens is as easy as depositing them. Click on ‘Account’ anywhere on OKEx to see your ‘My Wallet’ page. Find the coin or token you want to withdraw and then click on ‘Token Withdraw’. Instead of a pop-up that generates an address for your deposit, you’ll see the same window display a field where you’ll paste the address for your destination wallet. Click ‘Withdraw’ and the coins will soon hit your other wallet. As one of the largest exchanges in the world, OKEx provides users with the ability to track their past orders and any orders that they have open as well. Click on ‘Token Trading’ and then ‘Classic Trading’ to see the main trading window. The bottom portion of the screen is a panel holding your open and historical orders. Wide Range of Assets and Contracts: OKEx has a robust variety of cryptocurrencies to buy, sell, and trade. 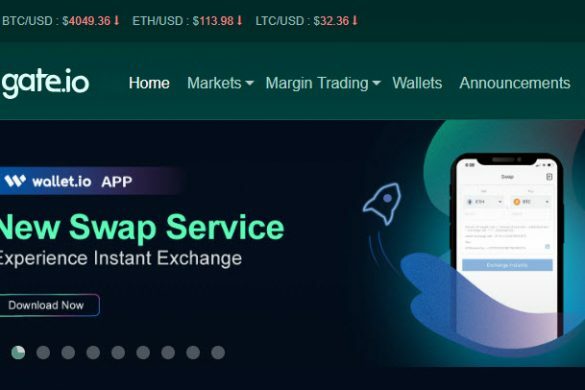 More impressive, however, is that the exchange offers both fiat-to-crypto and crypto-to-crypto trading pairs, futures, and the option to trade on margin. OKB Coin: The exchange’s own OKB coin is used as a counter currency for every cryptocurrency available on OKEx, and it also provides an incentivized profit-sharing program that rewards traders and investors for participation. 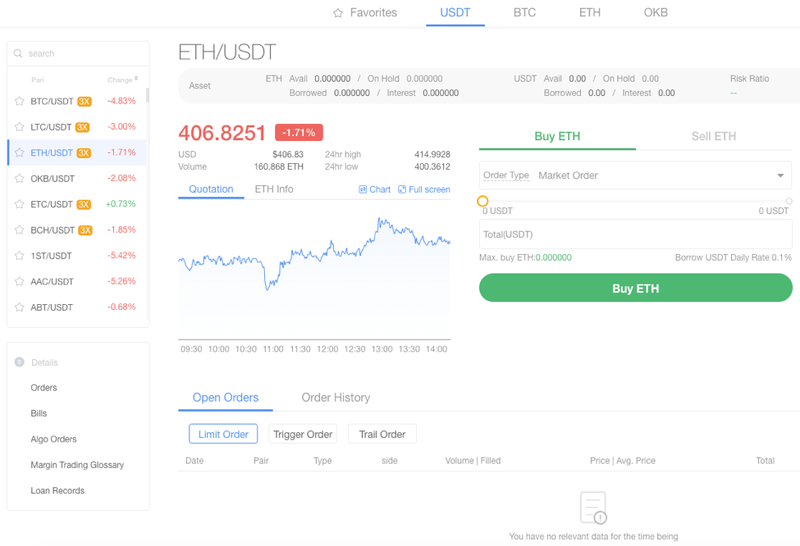 Every Friday, OKB holders receive 50% of the service fees collected by OKEx over the week and also obtain a discount on trading fees. Strict Rules Regarding Nationality: People from countries where cryptocurrency is still unregulated, and firmly in the “grey area” of national tax and financial compliance rules are not allowed to trade on OKEx. This cuts out traders from geographies where cryptocurrency is otherwise popular, such as the United States. Cluttered Interface: Though the inclusion of several useful tools and settings is thoughtful, it makes even the ‘Classic Trading’ interface messier, and somewhat confusing for uninitiated traders. This thorough overview and guide to OKEx displays the strengths and weaknesses of one of the most admired exchanges in the world. The best way to learn any exchange inside and out is always to try it for yourself, however, and OKEx is no exception. If you want to trade the most popular cryptocurrencies, buy and sell futures contracts, and also employ leverage, this is one of the best destinations around. Beware the geographical restrictions on membership and steep learning curve, however. It can take time to get acquainted with the nuances of OKEx, but once you’ve familiarized yourself with the inner-workings, you’ll find that few exchanges can match its functionality and speed.